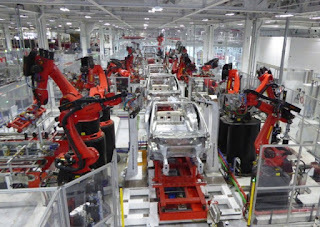 Earlier this week, Captain Gadget published a video inside of Tesla's 5.3 million sq ft Fremont Factory in Calfornia where the Model S and X are currently produced by 580 giant autonomous robot arms, including Elon's favourites "Thunderbird & Cyclops", and a handful of employees responsible for installing the interior trim. This is one of the most detailed video so far of the actual factory in Fremont where you can see aluminium coils unrolled, flattened and then laser cut to mould parts of the vehicles, while automated guided vehicles bring the batteries to the assembly line and install them. Tesla's Fremont Factory has been able to push up to 50,000 vehicles off the production line last year and moving some of the production to the Gigafactory in Nevada will increase these numbers tenfold to 500,000 when the Model 3 comes begins production.